Riveredge, the Hassler training facility in Chesapeake, MD was the perfect setting for the rewarding/educational Bo Jena clinic. It's owned by John and Leslie Malone. I knew it would be nice, and I saw myself tip-toeing around the place trying not to gawk. I felt like I was going to visit the equestrian version of the Biltmore Estate. As we drove through the main entrance and along the treelined drive, our van was filled with "ooohs" and "ahhhs." I marveled that a mere $45 not only got me admittance to a clinic, but also the chance to spend the day at a premier facility. We walked into the courtyard toward the entrance doors. I coached myself a little. "Act like you belong here, and don't snoop!" As we walked into the barn, a greeter welcomed us. We were given a program of the day's events, a pen, and a notebook for notes. I was feeling less like an interloper now. As I walked down the aisle to the restroom, a blonde woman was walking the opposite direction. She nodded at us and smiled. "Are you enjoying youselves?" We told her we were, and my friend Nancy told me I had just met Suzanne Hassler. Throughout the day the Hasslers and the staff were so gracious--I just can't say enough about how beautiful it was, yet also homey. No one is holding their breath as they walk around. Here's where I wanted to snoop around. nothing you can do to make dirty blankets elegant. Tackup stall. Apparatus in middle is saddle/bridle rack, sold for $850. 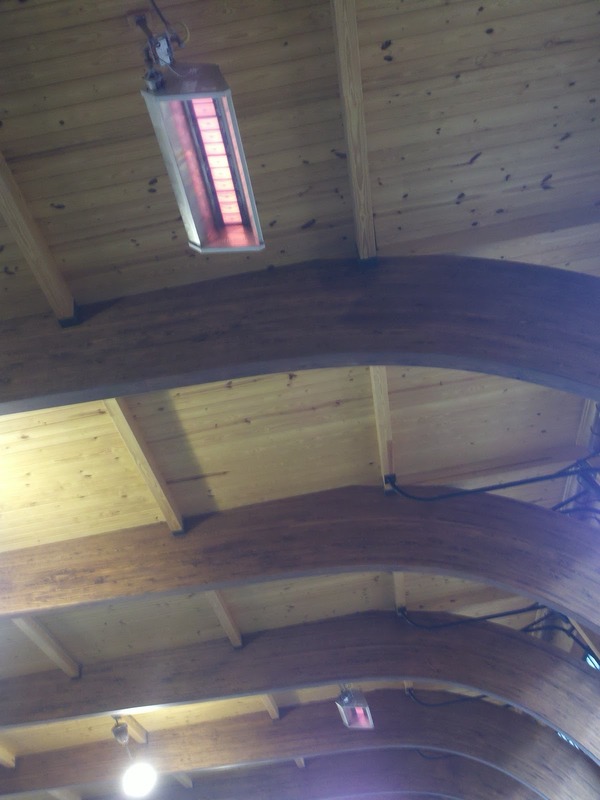 Heaters installed in the arena. 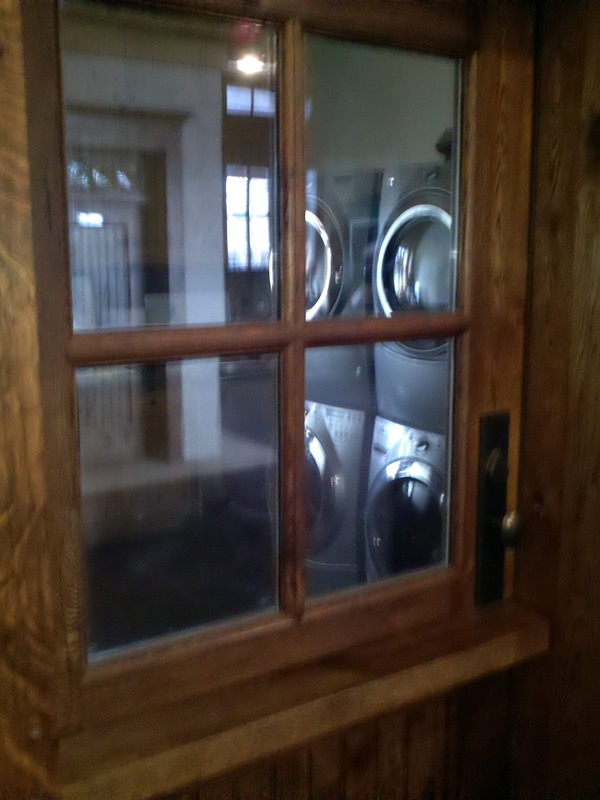 I'm sure they're used sparingly but we enjoyed the warmth. Welcome to the lap of luxury! Once, I visited a gorgeous NARHA center at a convention. 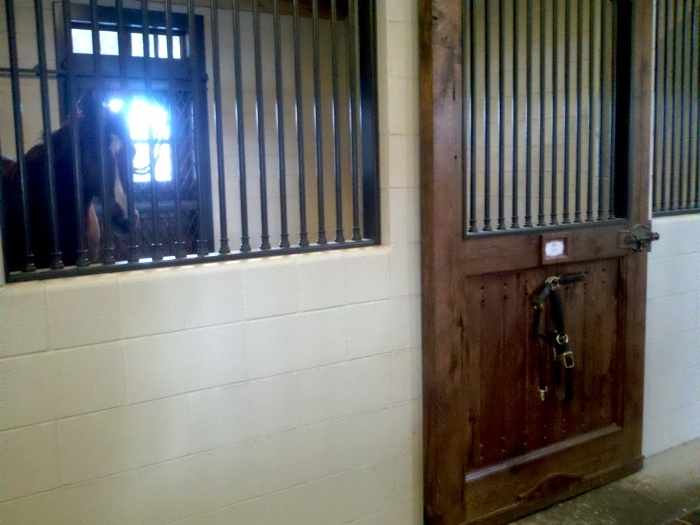 I could not stop myself from gawking when we got to the tack room. 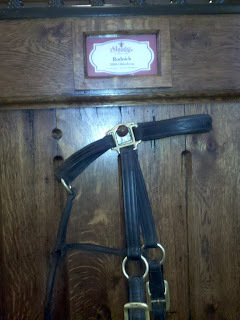 There was one of each type of equipment for each horse complete with the horse's name. The best was a professionally-fitted saddle reserved for each horse. 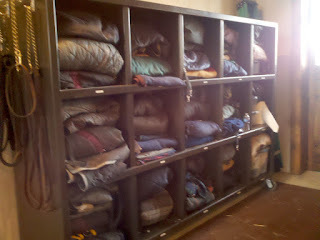 These may sound like necessities, but when you work at a nonprofit, they are definitely luxuries! I worked at a lovely farm in Ont named Kingride. Its privetly owned but most of the 'action' shots from the Running Fox catalog are taken there. Ah, the lap of luxury. It would be lovely to have a place like that and, of course, the staff to take care of it so all you had to do was play with the horses. this gloriousness is for the humans- remember that, folks! 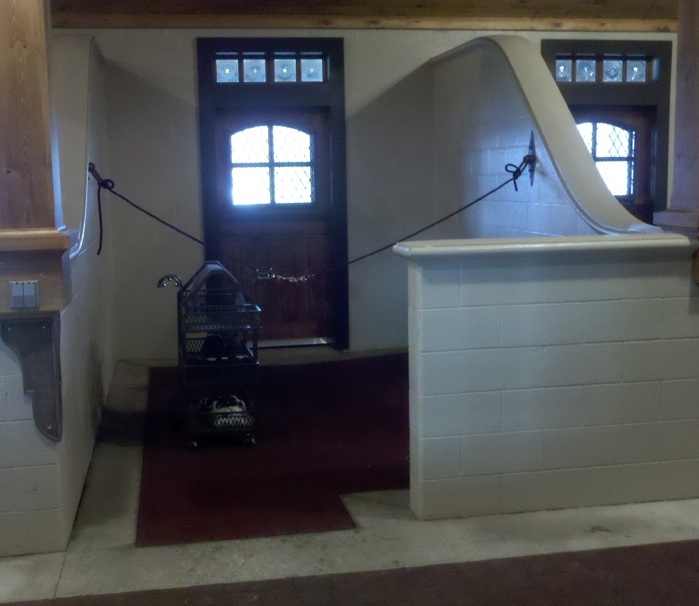 I love seeing photos of luxurious barns/stables. That laundry room really made me drool - I'd be carrying MY laundry out there to do it in the barn! 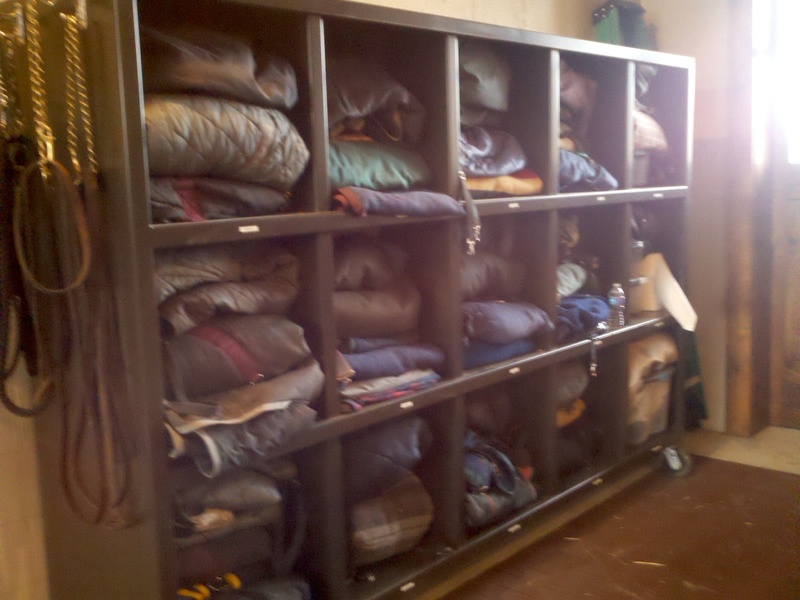 All that said, the only thing I really want that I don't have in my much more humble barn is a finished feed/tack room with a "kitchenette," work counter, and a big overstuffed chair. And here I am getting excited about us purchasing our first farm w/ an 80 year old classic big red barn, old 12x12 stalls that need some serious rehabbing, and an isle just big enough to walk down/not bump a horsey head on! I hate to think of what the up-keep costs (much less mortgage and taxes!) on that sort of place would be!